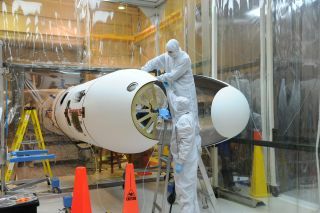 At Vandenberg Air Force Base in California, a fairing is installed on NASA's NuSTAR satellite Friday, Mar. 2, 2012 to protect the satellite as it travels through the atmosphere and into space. The satellite will be mated to Orbital Science's Pegasus rocket. NASA will offer a sneak peak at its next spacecraft to launch, the black hole-hunting Nuclear Spectroscopic Telescope Array (NuSTAR) observatory, during a press conference Monday (June 11). NuSTAR is due to lift off next Wednesday (June 13) at 11:30 a.m. EDT (1530 GMT) from Kwajalein Atoll in the central Pacific Ocean. The space telescope will use X-ray eyes to study how black holes form and how they grow within galaxies, affecting their evolution. The $165 million is due to launch on an Orbital Sciences Pegasus XL rocket, which will be carried into the air by an L-1011 Stargazer aircraft. Once aloft, the plane will release the rocket, which will then fire its engines to climb the rest of the way to orbit. The Stargazer plane left Vandenberg Air Force Base in central California on June 5, and was due to land on the atoll June 6. Omar Baez, NASA launch director, Kennedy Space Center, Fla.
Fiona Harrison, NuSTAR principal investigator, California Institute of Technology, Pasadena, Calif.
Grace Baird, NuSTAR bus chief engineer, Orbital Sciences Corporation, Dulles, Va.
Live audio of the press conference will be broadcast at http://www.nasa.gov/newsaudio .